The above info came from fbrana, and was edited by yours truly (contact me). The image came from Amazon.com. 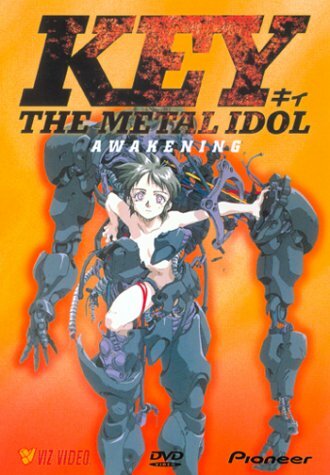 Clocking in at 13 30-minute OVA episodes and 2 95-minute OVA episodes, Key The Metal Idol is a must in any sci-fi fan's collection. This thought-provoking anime pushes the boundaries of man and machine, all the while giving new meaning to the phrase "virtual idol". Tokiko Mima, nicknamed Key, is a robot. Just about the only people who believe her are her grandfather, Murao Mima, and her bodyguard, Tomoyo Wakagi. When Key's grandfather mysteriously dies, he leaves a message to her... that in order to become human, she must make 30,000 friends. So Key heads for Tokyo, under the watchful and secret eye of Wakagi, and rooms with her old classmate Sakura Kuriyagawa, who for some reason is always nicknamed "Ms. Chugawa" by her crush Shuichi Tataki. Key's objective is to become an idol singer like the famous Miho Utsuse who has mysterious ties to Jinsaku Ajo, the president of Ajo Heavy Industries who is interested in capturing Key for his own military purposes.